Most modern internal combustion engines are cooled by a closed circuit carrying liquid coolant through channels in the engine block and cylinder head, where the coolant absorbs heat, to a heat exchanger or radiator where the coolant releases heat into the air (or raw water, in the case of marine engines). Thus, while they are not ultimately cooled by the liquid, because of the liquid-coolant circuit they are known as water-cooled. In contrast, heat generated by an air-cooled engine is released directly into the air. Typically this is facilitated with metal fins covering the outside of the Cylinder Head and cylinders which increase the surface area that air can act on. Air may be force fed with the use of a fan and shroud to achieve efficient cooling with high volumes of air or simply by natural air flow with well designed and angled fins. The Volkswagen Beetle, Type 2, SP2, Karmann Ghia, and Type 3 all utilized the same air-cooled engine (1938-2013) with various displacements. 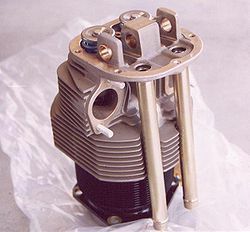 Most aviation piston engines are air-cooled. While water cooled engines were widely used from the early days of flight, air cooled engines were the dominant choice in aircraft. Following the Second World War, turbojets and jet turbine powered aircraft have come to dominate flight regimes where water cooled piston engines offered the advantage of reduced drag. Today, piston engines are mostly used in slower general aviation aircraft where the greater drag produced by air cooled engines is not a major disadvantage. Therefore, most aero engines produced today are of the air cooled variety. Today, most of the engines currently (2005) manufactured by Lycoming and Continental and used by major manufacturers of light aircraft Cirrus, Cessna and so on. Stationary or portable engines were commercially introduced early in the 1900s. The first commercial production was by the New Way Motor Company of Lansing, Michigan, US. The company produced air-cooled engines in single and twin cylinders in both horizontal and vertical cylinder format. Subsequent to their initial production which was exported worldwide, other companies took up the advantages of this cooling method, especially in small portable engines. Applications include mowers, generators, outboard motors, pump sets, saw benches and auxiliary power plants and more.